DillBlox Power Distribution Modules are designed to provide flexible, easy to configure electrical distribution panels using standard off the shelf components. DillBlox Modules have a unique interlocking edge and can be joined together using the dovetail wedge. The result is the creation of a strong, rigid panel assembly. Standard Modules are available to accept most plug-in devices that are widely used in over-the-road, off-road, construction, and agricultural vehicles. 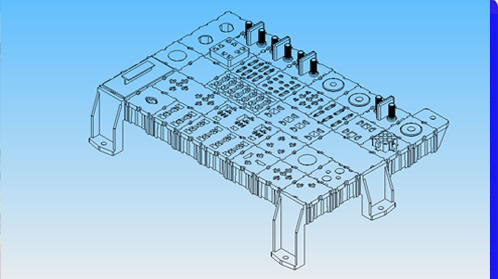 Custom designed modules can be provided at a reasonable cost for special applications. Fargo Assembly of PA stands behind our products 100% and provides technical assistance for selection and application of Dillblox power distribution systems, design of Dillblox for new or different applications, design of custom connectors and harness components, and design and drafting of wire harnesses to be used with our Dillblox panels. We can supply pre-assembled Dillblox Panels. Whether you want a panel that is ready to wire and silk-screened or one that's loaded and electrically tested, Fargo Assembly of PA can get the job done. We also offered an array of tooled components such as our Sealed Maxi Fuse Holder. For currently available tooled components click here. Our Dillblox Catalog can be downloaded here. Our Dillblox Library of Plan Views and Wire Entry Views can be downloaded in DXF format here. Below are links to all of our Dillblox products. Copyright © 2010 Fargo Assembly of PA, Inc.